When laundry day rolls around, you won't get very far unless you have a dorm laundry hamper included in your supplies for college. You'll witness unprepared college students stuffing dirty socks and linens in their college backpacks while embracing armloads of other dirty clothes. These most unfortunate students neglected to include a basic laundry hamper on their college checklists. 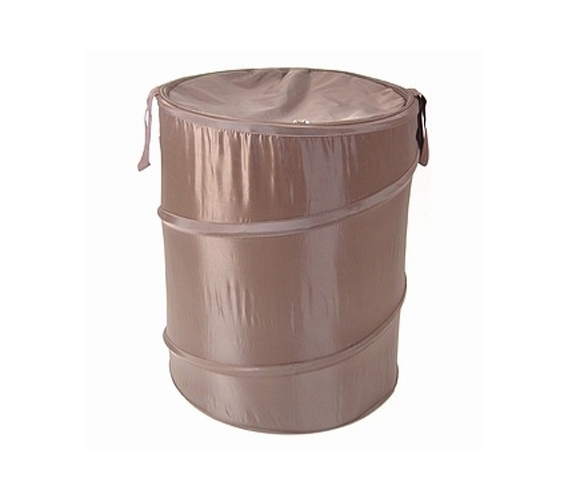 We have to say, this Dark Brown Bongo - Durable Dorm Laundry Hamper shows that you're prepared, and it even rubs it in a little bit! More than just your basic, cheap laundry hamper, this college hamper is ideal-sized. It'll hold a large amount of those stinky clothes but also keep you responsible; you won't be able to go all semester without doing laundry. The nylon materials of this laundry hamper for college students is good, durable material, so this hamper should have no trouble being your laundry companion beyond that first year of college. Nylon also isn't as absorbent as cotton or other fabrics. This means those not-so-great dirty laundry smells won't meld into the materials as easily. And when it's time to store this hamper, you'll see it compresses nice and flat, making it one of the most convenient college items to store. Speaking of storage, grab an extra hamper like this to hold your other dorm room supplies, from blankets, to shoes, to even some extra pillows or another dorm bedding set. Hampers are useful dorm products, so don't limit them to only laundry!